Nowadays, it’s hard to find a decent refrigerator to fit a smaller kitchen or a 30-inch cabinet. You have to buy an expensive French door around $1,500 or a cheap $600 top mount refrigerator. Samsung has a functional, full-featured 18 cubic foot top mount designed to fit your smaller kitchen. In this article, you will learn all the features of the RT18M6215SR/AA, potential alternatives, if it's reliable, and if this refrigerator is right for you. But first, let’s explore refrigeration and why you may be having such a tough time finding a top mount or decent smaller refrigerator. You walk into any appliance showroom and see this. It is mostly French doors (side-by-side top with a bottom freezer). Twenty-five years ago, it was top mounts and side-by-side refrigerators only. We had a 23 cubic foot Amana top mount growing up in our house in Needham. Now that size is not even available. So, what happened to top mount refrigerators and why are they not as popular? First, refrigerators are the most heavily regulated appliance for energy consumption. Buying a new refrigerator will have a huge positive impact on your energy bill. In fact, consumers are expected to save 1.7 trillion dollars in cost savings by the year 2030. Top mounts or freezers on the top refrigerators are not as efficient, so over time manufacturers have curtailed production of these models.  Every time there is a new standard, you will see even less of a selection. Also, the average French door is more expensive. Manufacturers will earn more by selling you a French door than a top mount. Other than Samsung, only Frigidaire has improved the top mount with any kind of features. Now let’s look at the Samsung which is a truly different refrigerator. 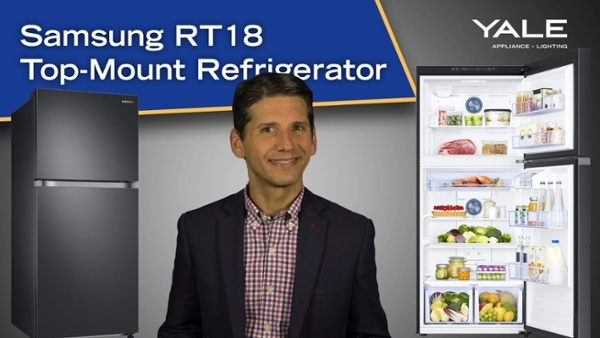 You probably do not think of features on a top mount refrigerator, but the RT18M6215SR is not much different from premium Samsung Refrigerators. 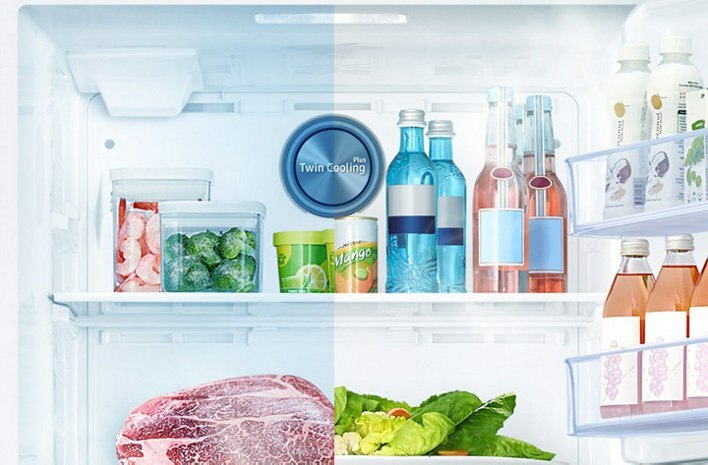 This refrigerator features Samsung’s twin cooling system, meaning the refrigerator and freezer air are separate. So tastes and odors are not cycled from your refrigerator to your freezer. Think fresh fish aroma in your ice cream. Also, there will be less freezer burn because the warmer refrigerator air will not affect the colder freezer. 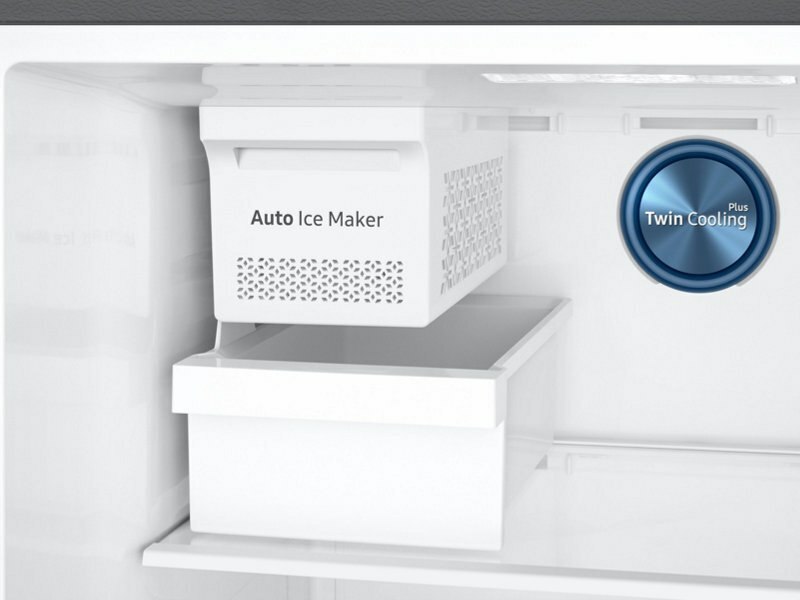 You also have the ability to change the freezer to a refrigerator with a flick of a switch and back again. If you are having a party and need the extra refrigerator space, this unit can be 17.6 Cu. Ft. of all refrigerator space. You can switch back to the freezer when necessary. The ice maker is standard in this refrigerator. It is unusual for a top mount. The door will match any appliance brand with its handle-less design. You won’t have another handle style in your kitchen. The hinge can be switched for either left or right without custom ordering. This is actually huge since most refrigerators are returned due to wrong hinging. There isn’t a top mount refrigerator competitive to Samsung in terms of features. There are less expensive units from Frigidaire, Whirlpool, and GE at $500-700. They will be basic refrigerators without the FlexZone or twin cooling. Samsung has a better design. Samsung has the least amount of service calls than any other brand at about 16% in the first year versus 29% for other brands based on our 31,761 service calls completed last year. Still, 16% is high, so you should find a service agent for Samsung or any other brands. You may have difficulty finding a dealer who services Samsung appliances in certain parts of the country. Appliances are on sale everywhere at certain times of the year. This refrigerator is $949 but drops to $804 during Black Friday, Labor Day, Columbus Day, Memorial Day, and President’s Day. You can still buy some decent, basic refrigerators for less money. However, if you want a good looking refrigerator with features, the RT18M6215SR may be your only consideration to fit a smaller kitchen. Want to learn more about Refrigerators? 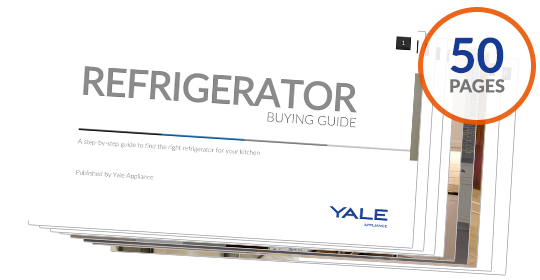 Get the Yale Refrigerator Buying Guide with features, specs, and detailed descriptions of every refrigerator available. Well over 355,000 people have read a Yale Guide.